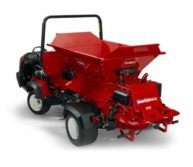 The new Toro ProPass™ 200 broadcast style topdresser delivers extremely accurate spread patterns from ultra-light dustings to ultra-heavy aeration hole filling applications without any guesswork. Available in both a utility vehicle mounted version and a towed version. Eliminate guesswork from setting up your spread pattern. Choose your spread pattern, identify your colour and make your adjustments. Evenly apply materials to the turf from 9 ft (2.74 m) to 35 ft (10.67 m) with the patented sliding adjustment for positioning of the twin spinners. This unique drop zone system adjusts where material lands on the spinner disks, resulting in an even pattern across the entire spread width. The spinners are fixed at a downward angle of 4° to provide accurate and consistent penetration of material into the turf canopy. A unique, four wheel walking beam suspension contains two separate axles so that all four wheels are always in contact with the ground regardless of terrain and an even weight distribution provides a light footprint on the turf. Tailgate opens, closes and pivots on a wedge creating an angle to force wet or dry material through the gate in a consistent flow. Eliminates load shifting of material and uses a tight rubber seal on the sides preventing material from escaping. Quickly change from the twin spinner to the optional cross-conveyer and swivel kit. The ProPass™ is available in a utility vehicle mount style such as for mounting on a Workman® vehicle or can be ordered in a tow version.